AMHERST, MA – Last night so many coats were stolen from Jenkins that the stolen coat has become its own cryptocurrency. Stolen Jenkins Coats (SJC) is open-source, its design is public, and everyone can take part. Mining coats is easy. Simply show your Amherst ID to the strange bouncers nobody hired, enter the building, and then have at it. Economists project coats stolen from Jenkins last night will become more valuable than bitcoin by 2018, especially the ones that had wallets in the side pockets! Yahtzee! Get started with SJC today. There are no consequences. 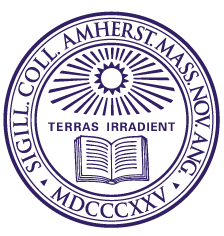 Amherst, MA — Amherst College’s investment club recently announced that it had completed the steps necessary to undergo a corporate inversion, reincorporating itself offshore to the Cayman Islands. Primary operations of the club will remain in the United States. When asked what, if any, taxes were being avoided in the move, Blackstone had already been hired by Bain, and was gone. We’re Pretty Sure the MoHo Version of Moodle is Called ISIS? MUCK-RAKE INVESTIGATIVE CENTER, Amherst, MA — Boy oh boy, look at what we’ve found. Hot off the presses, it looks like—and this could be wrong—but it looks like the Mount Holyoke version of Moodle is called ISIS. Just like the terrorist organization. Just imagine, right? ISIS is a big deal in the news. Is it still called ISIS? ISIL? All I know is this is a hot scoop if I’ve ever seen one. Me and the boys on the Muck-Rake Investigative team are going nuts with questions. 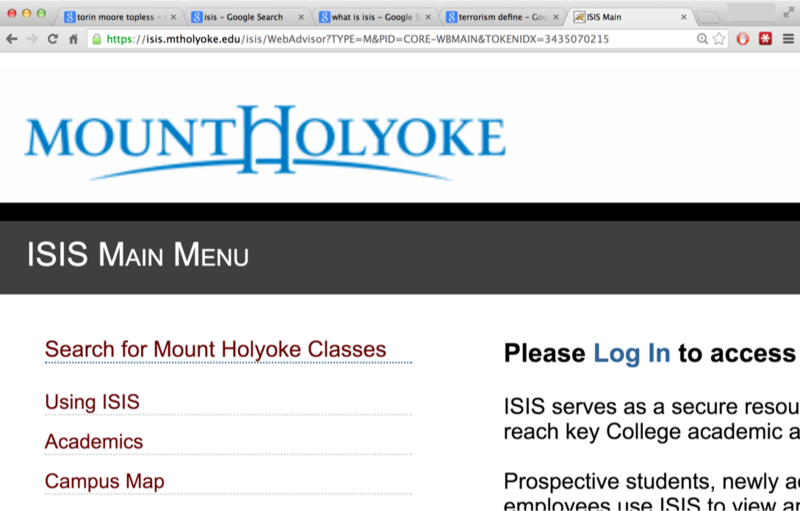 First off, is Mount Holyoke’s ISIS the same as the terrorist organization? It seems like it would be a weird coincidence otherwise, so we called ’em up. No answer. We learned, through our investigations, that everyone at Mount Holyoke had the day off to get some exercise and fresh air. All right, sounds good, but that brings us to the next question. Are today’s coordinated training “exercises” related to the ISIS infiltration of Mount Holyoke College? Clearly the conspiracy here runs deep, and right when we start asking questions, the entire school basically up and leaves. More questions still remain: has ISIS been gaining ground outside of its Mount Holyoke stronghold? Will Obama respond with strategic air strikes around the Blanchard Campus Center? Is the ISIS service user friendly for Mount Holyoke students? Now, this could be overblown. ISIS could merely be an information network for the school to share class schedules and the like, as the site explicitly explains, but the Muck-Rake is going to keep asking questions to get you, our dear readers, the answers you deserve. (deputymetroeditor)– In the time since I posted “Peter Uvin, Masturbator?” on this website, I have had several conversations about the article and the controversy it provoked. I published the article because the incident it described was a newsworthy story. However, I should have taken a different approach in doing so. Making clear why I thought this story was important and highlighting the issues that it raised would have encouraged a more productive discussion about the issues behind the story instead of the wild speculation about my supposed anti-masturbation agenda that occurred in its place. Ironically, my attempt to leave my personal opinions out of the story probably created more controversy than if I had included them in the article. I had chosen to write the article in (what I thought was) an “objective and unbiased” tone because I knew that masturbation is a controversial subject at the College. I wanted to separate the story from my personal views on jerkin’ the gherkin because I thought doing so would benefit discussion on the real issue behind the story—the regulative vacuum in which an administrator flogging the dolphin exists—rather than my own beliefs about the masturbation question, especially since I don’t have a particularly strong opinion on the matter. I purposefully attempted to include various administrators’ side of the story and emailed them a partial draft to ensure that they thought I was being accurate and fair, and I refrained from any editorializing in the article (in contrast to previous investigative pieces I have written for this site). Throughout the whole process, I made every effort to produce a balanced narrative that included a range of perspectives on the incident. This strategy obviously failed. Judging by the comments, a significant number of students and alumni believe that I am either an anti-five knuckle shuffle fanatic with a large axe to grind or a sordid trader in salacious gossip. Neither description fits reality, but this ill-founded conjecture ultimately distracted people from my real purpose in writing this story. This was in some ways my fault—by not stating explicitly why I wrote this article, I left people guessing about what I really thought about charming the snake instead of debating the issues I hoped to raise. To be explicit about my “agenda” in writing this article, I think that the lack of oversight of administrators roping the pony creates circumstances—such as the one discussed in the article—in which the College is unable to respond to potentially groundbreaking student inquiry in a timely fashion. Additionally, I think there has been an unjustified taboo on discussing the role of playing pocket pool in creating a campus culture in which waiting around for email responses occurs on a far too frequent basis; holding the sausage hostage obviously isn’t the root of all evil, but the regulative vacuum in which it exists necessarily begets inconvenient situations. The response to this doesn’t have to be the outright banning of going to the palm prom, but we have to figure out how to address this problem if we want to make real progress towards a better campus community. I should also note that my purpose in writing this article was never to attack Peter Uvin or the other administrators involved. While I think that the decision to not respond to my email for almost two hours failed to account for the potential effects that it could have had, the administrators involved appear to have taken precautions to ensure that they check their inboxes before engaging in some hand to glans combat in the future. Their actions, however, highlighted the problem I discussed above—what if they hadn’t taken those precautions? To make a long story short, I made one mistake by not being explicit about my reasons for writing the article, and I made another by not being upfront about the fact that I like applying the hand brake as much as the next guy. For those I apologize, but I do not in any way regret publishing the article. This incident highlighted a gap in the College’s ability to aid its students in criticizing its own decisions, and it showed that the unregulated nature of fiddling the flesh flute can create potentially dangerous situations in which the students cannot meet their deadlines. Those reasons alone made it worth publishing. THE MUCK-RAKE INVESTIGATES: Peter Uvin, Masturbator? (deputymetroeditor)– At 9:56pm on Thursday, February 20, I emailed Provost Peter Uvin a list of questions in hopes that his answers would help me write an article for an unfunded, highly controversial online student publication. At 11:35pm, I received an email back. What was Uvin doing in the meantime? Last night, I emailed Peter Uvin a list of questions related to a piece I am writing for a student publication. It took him nearly two hours to respond. I was hoping you could inform me as to whether or not he masturbated during that time period. At the time of this writing, not one has responded. Why? Are they protecting the Provost? Are they all masturbating at this very moment? It’s quite possible. A 1993 study of the masturbatory habits of adult-aged Americans concluded “most… Americans over the age of 30… have… [masturbated].” Though their actions and decisions frequently suggest otherwise, the administrators of the College are indeed American adults. [ed. note: Peter Uvin is of unknown national/planetary origin]. Therefore, it is very likely that one or more College administrators is masturbating as you read this. Neither are student leaders immune from this plague upon our institution. AAS President George Tepe ’14, whose association with masturbation was hotly debated during his campaign, also refused to comment on the matter at hand. If you’re anything like me, the thought of all this is repulsive: leaders in our community, masturbating without approval of the student body while the College burns to the ground. There can be no justice while serial masturbators are allowed to run this institution and dominate the narrative; there can be no peace of mind while our emails remain unanswered. EVANSTON, Il. – Emily Gill ’15 recently returned to Illinois after a semester abroad in Paris, and has reportedly spent the last three weeks enduring her family’s mundane American home life. 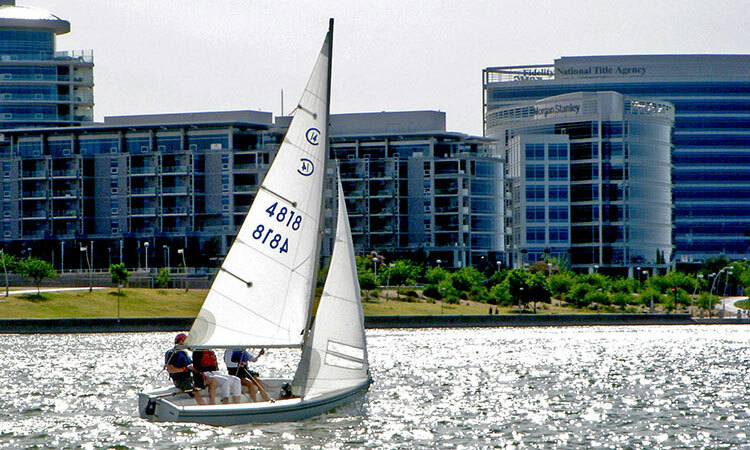 Since returning home, Gill has spent much of her free time smoking cigarettes, listening to the music of obscure French singer Carla Bruni, and wrinkling her nose at her parents’ Hamburger Helper dinners. 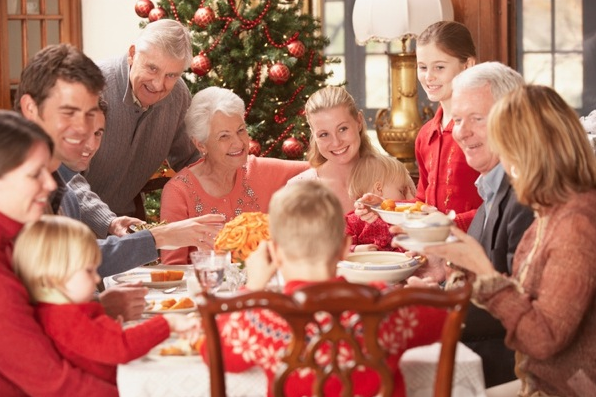 Recently, with the holiday season in full swing, Gill has been feeling the lack of culture even more acutely.